Jack Regas was born on June 24, 1923 in La Grande, Oregon. He lived there for the first five years of his life and then his family moved to the San Francisco Bay area where Jack has spent the balance of his life. He started working for Kaiser Industries in 1950 as a welder before he became involved with the Kaiser boat racing program in 1954. When Kaiser got out of racing in 1957 Jack became a field representative for the Willys division of Kaiser industries. Later he became a quality control technician for Kaiser Aluminum. Jack Regas is the #5 all time driver [as of 1991] in terms of winning percentage among the nearly 200 drivers that have competed in the modern history of the sport. He is the first driver to officially record a speed in excess of 200 m.p.h. in a propeller driven hull having registered a clocking of 200.442 m.p.h. for one run through the kilometer trap in 1957. Jack's boat - the Hawaii Kai III - is the most significant record setting hull in the modern history of unlimited racing considering the number of m.p.h. added to the important records as well as the number of years these records were held. The important records are those over the standard course for the standard distances of lap, heat, and race as well. As the mile straightaway record. In addition the Kai set a record of running 300 consecutive miles at a winning pace in 1957-58. Jack Regas was the driver of the Hawaii Kai III during all of her important record breaking performances and for this reason as well as those mentioned above is one of the most remarkable drivers in the long history of boat racing. Thunderboat: How did you get involved in boat racing? Regas: I worked for Kaiser Rock, Sand and Gravel and I was a welder. Mr. Henry Kaiser Sr. had my boss Bart Carter bring three men up to Lake Tahoe to build a boat house for him. So while we were building the boat house, Mr. Kaiser had a boat named Scooter. He had two Cadillacs in it and a sliding canopy — a real plush boat. He took some guests out for a ride one time and some little kid with a B-hydro walked off and left him — made him mad I guess. And he came back and had Bart pull both engines. He had Bart keep us three men there to work on the boat — and I never worked on a boat in my life. We pulled out the 2 Cadillac engines and installed an Allison and completely rebuilt the boat. Thunderboat: Would you give us the story on how you came to be the driver of the rebuilt Scooter? Regas: When we got the boat rebuilt, I asked Mr. Henry Kaiser Sr. to drive the boat. And he says, "Are you married?" I said, "Yes sir, I am." Then he said, "Well, you can't drive the boat." I said, "Well, why?" He says, "It's not right. You shouldn't drive the boat being married on account of the danger." He says, "I've hired a man. He's going to be down next week to try it out." We tried the boat out at a water filled gravel pit at the Kaiser Sand and Gravel plant near Pleasanton, California. The pit was about 1/3 of a mile square. So this fellow came up to try the boat out. I was doing the testing on it before he came. I knew you had to go from corner to corner to get distance and any speed and you had to turn left on account of the propeller torque. When this new guy came down, we dropped him down to the water. We told him to go from corner to corner. And he said, "O.K." So he started down to the corner. He must have been going 75 or 80. But he turned right and they don't turn right. The boat climbed right up the bank of the gravel pit. The whole boat was out of the water. The rudder and skid fin dug its way into the bank and it just hung there. Mr. Kaiser said, "Take the boat back to the shop. Tear the transom out. Tear the rudder out. Tear the shaft out. Take it back to the shop and rebuild it and bring it back to Lake Tahoe. Have Jack (Regas) bring it up." We worked about two weeks on it and had it all ready. So I drove the truck up — pulled the boat up to Lake Tahoe. And Mr. Kaiser said, "Well Jack, do you still want to drive the boat?" I said, "Yes sir, I do." And he said, "O.K., you can drive the boat." Thunderboat: Your first race was a one heat 6 mile contest called the Lake Tahoe Championship in July 1954 against Stanley Dollar with his Short Snorter (ex Miss Peps V) and two limiteds. Could you give us an account of your first race? Regas: Stanley Dollar beat Mr. Kaiser on Lake Tahoe every year for I don't know how many years. He (Dollar) had an Allison in his boat — the boat would really go. So I went down to Chambers Lodge, pulled into the pits and walked up the pier. The guy says, "My name is Stanley Dollar." I said, "My name is Jack Regas." He says, "I understand you plan on beating me." I says, "Well, I'm sure going to try." He says, "Well, good luck." And I said, "Well, good luck to you too." I never drove a race in my life — never made a start with a 5 minute clock. I didn't know what I was doing. So I just watched him (Dollar). And he was coming from way down there. I just punched it and beat him to the starting line. I made it to the first turn and he never caught me - never caught me. It was a three lap race and I beat him. Regas: I was worried about all of them. Like I say that Breathless showed some good speed. And I thought maybe he was going too be the one to beat. Once you got in front of than it was no problem. You just stayed in front and that was it -- no problem. The boat I was driving, the first Scooter, had a low gear ratio and a big wheel. Man, she would get up and go. I could get at least 125 m.p.h. at 4000 r.p.m. Thunderboat: How did Scooter Too come about as your boat for the 1955 season? Regas: After I won the 1954 Mile High Gold Cup, I brought the boat in and she sank. The Allison shook the seams all apart. So Mr. (Henry) Kaiser Sr. said, "Don't worry about that, boys. We're going to build a new boat." So we built the Scooter Too. we built it in the shop at Livermore, California. Bart Carter was the boss. Bart followed the plans of the Slo-mo IV, but they had to make the boat wider and deeper because of the W-24 Allison engine. The W-24 was the idea of Mr. Kaiser Sr.
Thunderboat: What was your opinion of the W-24 Allison engine? Regas: The engine had a lot of power, but you couldn't keep it together. You could not turn the high r.p.m.'s. I blew a lot of engines. I turned then too high. I just didn't understand until Mike Welsch explained the danger of over revving the engine. And then I got it preached into me. Thunderboat: Could you give us your recollections of the 1955 Gold Cup — your first race in Seattle? The Scooter Too was completed shortly before the race. Regas: I ran something through the right sponson before the start and I was out. Thunderboat: In the 1955 Mile High Gold Cup you led by 100 points and had a significant elapsed time advantage over the field heading into the final heat. You needed only a second to win the race, yet the Scooter Too failed to start. Could you comment about this as well as how you felt your boat matched up with Kaiser's Hawaii Kai I, driven by Ken St. Oegger? Regas: I think I lost the quill shaft and that is why I couldn't run in the final heat. In my opinion at the time the Hawaii Kai was a good running boat. I just saw it a short while up at Tahoe and it rode good. It had a fantastic engine -- one of Gidovlenko's engines. Kenny was a real charger. The Scooter Too had too much weight. The boat weighed close to 8000 lbs. I had that big engine and all the extra fuel I had to carry and gas is 8 lbs. a gallon. It was just a heavy boat. I figured Kenny was going to wax me. Thunderboat: You were at the mile trials in Hawaii in early 1956 with the Scooter Too. The original Hawaii Kai was there to make a run and cracked up. Would you give us your account as to what took place? Regas: The wind blew there every day for six weeks. One day the wind just stopped just like turning off the lights. Kenny (St. Oegger) got his boat (the Hawaii Kai I) in the water first. Otherwise if I could have gotten out, I would have gone first - but he beat me to it. Boy, he was smokin'. He was screaming - really revving it high. All of a sudden it was just water. Both of us had made runs before - but it wasn't fast - just to run. We tried the course a couple of times to get used to the water. But when Kenny cracked up, Mr. Kaiser called it all off - sent us all home. Thunderboat: After the crack up in Hawaii, could you give us Kaiser's racing plans for 1956? Regas: The first thing I knew Bart (Carter) told me they built a boat called Hawaii Kai III. I said, "What happened to II?" He said, "They're saving that for Kenny." They built the III for Howard Gidovlenko. Howard had George Mokski and a couple of guys on his crew. And I had the Scooter Too with Bart Carter and his son Richard and another guy named Tim Lee as my boat crew. Thunderboat: Your first race of 1956 was at Lake Tahoe in early July. You won two preliminary heats and were leading in the final heat when the Scooter Too threw a prop and sank for the second time of her career. Could you comment? Regas: I was just pushing too hard. And I caught heck for it. I could have backed off and won the race hands down. I just kept pushing it and pushing it. She just wouldn't take it -- too many r.p.m.’s. I never learned. I never learned this r.p.m. business. I had to go for it and that's what I did. I used to get more balling out. Oh my God, I couldn't understand why. I couldn't understand why I was catching hell all the time. Thunderboat: The next race was at Seattle and your boat the Scooter Too again threw a prop and sank for the third time in four races in the first heat. This gave you your first chance to drive the Hawaii Kai III in the second heat. What was your reaction to the boat? Regas: The problem with the Scooter Too was that I was throwing props all the time — just too much power on and off the throttle too fast. After I had sunk the Scooter Too they towed me back to the pits. And I went upstairs to watch the race on T.V. Mr. (Edgar) Kaiser sent somebody up to get me. I came downstairs and he (Edgar Kaiser) says, "Do you think you can drive the Kai?" I said, "I don't know, I think I can." He said, "Well, I want you to run the next heat in the Kai." I said, "How about Howard (Gidovlenko)?" He says, "Howard's not with us anymore." I have no idea what happened. I never heard. Thunderboat: After the 1956 Seattle race, could you tell us the Kaiser plans for the Gold Cup at Detroit and your account of the race? Regas: After the 1956 Seafair race, the Scooter Too was not repaired. Mr. (Edgar) Kaiser wasn't going to mess with it anymore. He told me, "Jack, I want you to go to Detroit with Howard and work on the crew." The Kai and the Slo-mo were both pitted in the Chrysler boat well. And then the Slo-mo cracked up. Mr. Kaiser talked to Mr. Sayres. So he took over the Slo-mo crew. The Kai had ripped out her bottom three days before the race. They got it repaired and I went out to qualify after Howard (Gidovlenko) and Edgar talked. I told Bart if I'm not going fast enough, wave me in. He did after the first lap. Then in the second lap he got excited when the boat got in rough water and started flying and he forgot to give me the signal after the second lap. So I continued on and missed qualifying by two m.p.h. But we finally got in the face after two other boats dropped out. It felt great to run with Shanty I during the race. Mr. (Edgar Kaiser) was tickled to death. Thunderboat: Between the 1956 Gold Cup and the President's Cup the Hawaii Kai III made the change from an Allison to a Rolls Merlin engine. Could you tell us the story behind the change? Regas: After the race was over Mr. Kaiser says, "We're going to stay here. We're going to change engines. We're going to the Rolls." So they kept the Slo-mo crew there and me. We made a complete change from the Allison to the Rolls and it took us a good week. After they got the Rolls in there, they put it in the water and I took it out and tried it. Man, what a difference. But our propellers were too big. The only reason I could run at Detroit was the water was rough and it was breaking free. But on smooth water you could never get it up. We were running a 21 inch pitch — big wheel. When I was winning we were running a 19 inch wheel. Thunderboat: At Washington in the next race you won your first heat running the Hawaii Kai in the President's Cup posting the second fastest lap and then you won the Rogers Memorial beating Shanty I while setting course records for lap and heat. What meant the difference? Regas: When we took the boat to Washington D.C., we had about a 21 inch prop on the boat. Anyway it ran good in the President's Cup as long as the water was choppy. I didn't win the President's Cup, but it ran good. Then after that they had a race called the Will Rogers Memorial. So Mike (Welsch) says, "Jack, you're not getting enough r.p.m. 's out of the engine, so we're going to put a small wheel on." We had a 16 inch wheel — a small one. So they put that small wheel on just in time for the first heat. I got out there and made a start and when I punched that sonofagun, honest to God, I was so surprised. She just literally jumped. She accelerated so fast — I was at 4500 r.p.m. before I could even pull my foot out. Right now! They couldn't catch me. And I beat them. I won both heats. It was that 16 inch wheel. Thunderboat: After winning at Washington, how did you feel about having the Slo-mo crew behind you.? Regas: Hey, I was tickled to death. I knew if anybody could get it running they could. Just look at the way the Slo-mo-shuns ran. I didn't know much about it at the time, but I knew that much. But I was green and I was go-go-go you know. I used to get my tail kicked more times from Mike. Oh boy, he used to really ride me. And he was right. Now I can see that he was right. But then I didn't. I used to get so mad at him. I just didn't understand. Thunderboat: Heading into the final race of the 1956 season at Las Vegas, Shanty I led in the High Point race over the second place Hawaii Kai III 1250 to 1052 points. After the Shanty I went dead midway through the final heat of this race, the Kai could have won the race by finishing as low as third and by allowing Miss Seattle and Tempo VII to finish ahead of her, pushed Shanty I down to an overall fourth thereby securing a 231 point advantage over the Shanty for the race — winning the High Point Championship in the process. Did you have any High Point strategy at the time? Regas: I'll be real honest with you, I didn't know anything about a High Point Championship. I could care less about that. All I wanted to do was win the races. That's all I wanted to do. Thunderboat: Could you describe for us the sensation or thrill of driving an unlimited Hydroplane and what in your opinion made you a winner? Regas: I just loved it. I knew that very few people ever got a chance to even. get close to an Unlimited. And here I am — a guy who never drove a boat in his life — getting to step into one of the richest men's boats. I don't know the reason for it, but it happened to me. I was very pleased about it. At the time all I knew was to drive and win. I wanted to win. I didn't want to be second. I didn't want to be second to nobody. And a lot of times I wasn't second. I guess you could call it bulldog determination or something like that, but that's why I won. I didn't want to be second. Thunderboat: After the 1956 season, Edgar Kaiser retired from Unlimited racing, but gave the boat to the Slo-mo crew to run during 1957 out of Seattle. How did this change affect you? Regas: Mr. Kaiser asked me if I would move to Seattle because he wanted me to work on the boat. He wanted me to work with the crew to get to know then and know the equipment. I said, "Fine." He said, "I'll find you a place to live and I'll take care of all your living expenses and everything." I said, "That's great." So they found me a place in Ballard. I used his Kaiser car which I later bought. We lived there for eight months. Thunderboat: Could you comment on the testing program that the Slo-mo crew put the Hawaii Kai through over the winter of 1956-57 and what it accomplished? Regas: Mike Welsch worked out a plan to test our wheels. He put a photo recorder in the boat. We had a box sitting behind my seat with a camera in it. I had a switch on my dash that turned the light on in the box and that turned on the camera to get the instrument readings. I'd do a steady 80 m.p.h. and then I'd punch it until I hit 140 and then I turned the camera off. That's the way we tested all our wheels — the acceleration on each wheel. We were trying to get the best wheel. That's how we settled on a 19 inch wheel. We worked out the balance to where it had to be 12 inches behind the sponson edge. We balanced the boat on the cradle and we kept moving weights until she was balanced 12 inches behind the sponson. And that was where we left it and the boat rode perfect. There was quite a bit of difference in the boat between 1956 and 1957. Thunderboat: At the Lake Chelan Apple Cup — the first race of 1957 — you turned a lap of 116 m.p.h. which was about six m.p.h. faster than anybody else that day. 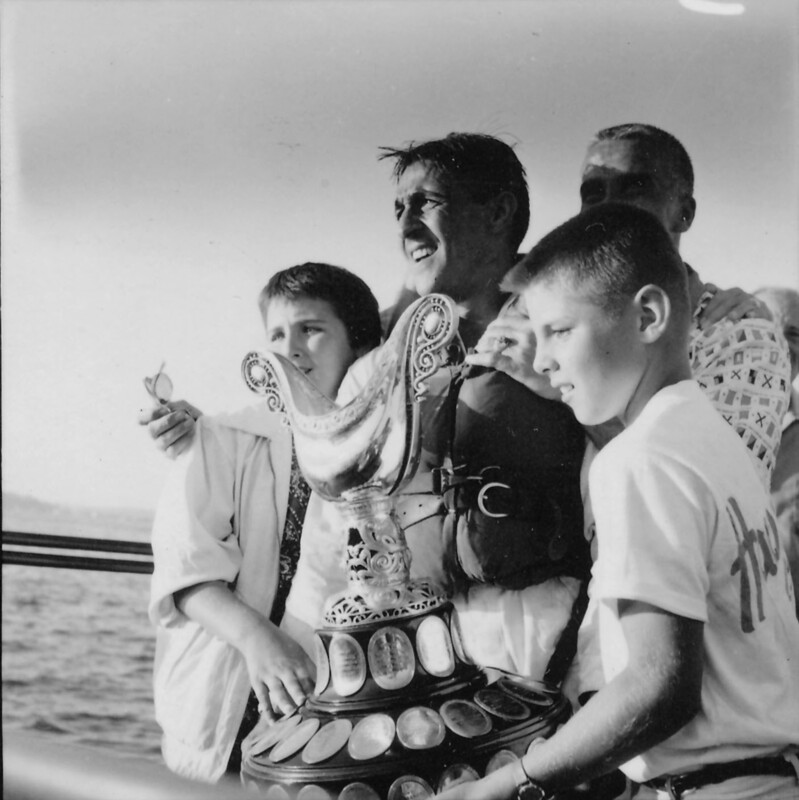 Although the Miss Wahoo was able to match your fastest laps in the next two races at Tahoe and Seattle, most people felt the Kai was the class of the field in 1957. Yet the best you could manage in these three races was a third place on Lake Tahoe — never going the distance. This was in contrast to your last four races of 1956 in which you ran 210 consecutive miles. Could you explain this? Regas: The Kai was a fantastic boat. Blowing the engines was my fault because I was overrevving the engine. When she came out of the water, I wouldn't back off in time to stop the overrevving. I got it down pretty good later on. I got able to back down real quick. But then I got to the point that I wouldn't rev her as high as I used to. I used to go to 4500, 4800. Hey, that's ungodly. If Mike would have known it then, he would have killed me. Oh, man. Also we did those acceleration tests on Lake Washington before the 1957 season in which we would go from 80 to 140. And unconsciously I wouldn't just ease it to the floor, I would tromp it to the floor. It was the way I drove. Thunderboat: Beginning at Detroit and continuing on to Washington DC you won three consecutive races — a total of 120 straight miles without missing a beat. At the same time you posted the fastest lap by 2 m.p.h., then 3 m.p.h., and finally 4 m.p.h. What caused your change of fortune? Regas: Mike wanted to go to a 5:8:0 gear ratio in the supercharger. He didn't like to use the 6:3:9 so we went to the 5:8:0. Otherwise I would have blown a lot more engines. And I knew I couldn't overrev the engine. I got to the point of instead of going to 4500, 4800, I stayed at 4000, 4200. I wouldn't go over 4200. That's when Mike put the tape on my dashboard. He said, "I want you to see that needle at all times." Since he put the tape on there, I never lost any more engines from overreving. Thunderboat: You drew Fred Alter and the new Miss U.S. I in heat 2-B of the Detroit Silver Cup. He led you for 2½ laps and then he spun out in the Detroit Yacht Club turn and was pitched out. Could you describe this incident from your standpoint? Regas: He came right out in front of me. I thought I had run over him. I made a hard left turn with the boat — I really gunned it — and I came back. I jumped overboard right near him and got a hold of him. He was face dawn. He was kind of groggy and I turned him over. And then they picked us up out of the water. The reaction I got in Detroit was real great. It made me feel great. Thunderboat: The Miss Wahoo as noted earlier posted similar speeds to the Hawaii Kai at Tahoe and Seattle, but at Madison Miss Thriftway not only posted a lap of 115 in comparison to the Kai's 116 at Chelan, but also a heat of 112 in comparison to the best the Hawaii Kai could do for 15 miles — 111 m.p.h. It appeared that the Thriftway was in a position to seriously challenge you. What were your thoughts? Regas: I just never thought about it. I was also confident that I would win. I was always confident of beating any of them because I had the equipment. I knew it was up to me then. I really started driving that boat right at the President's Cup. Thunderboat: At the final race of the year at Las Vegas you had a thrilling duel with Thriftway Too in the third heat for first place even though you could have ensured a victory by placing second. Why did you go out and do battle with the Thriftway Too? Regas: Hey, that's a silly question. I just didn't want to be second. I didn't think that big dog could go that fast. I figured they'd found out something that they didn't know before and it was working — maybe a smaller wheel. I looked at him once and he was on his side. I could see his bottom. It was rough. I didn't want them to say they beat the Hawaii Kai. I didn't want them to say that. And they would have said that. Thunderboat: On November 29, 1957 Hawaii Kai III set a kilometer record of 194 m.p.h. besting Miss Supertest II by 10 m.p.h. The next day you raised your mile mark of 183 m.p.h. to 187 m.p.h. exceeding the Slo-mo mile of 178 m.p.h. by 9 m.p.h. Heading into the trials where did you think the Hawaii Kai would set the record? Regas: I was shooting for 200 m.p.h. We missed it on account of the dew point. I could only get so many r.p.m. out of it. Thunderboat: After the mile trial, the Kai's owner Edgar Kaiser decided to quit racing for good. What were your feelings at that time? Regas: I was upset. I mean all that hard work and on top and then he decides to quit. Thunderboat: Could you give us your assessment of the Hawaii Kai III's performance in 1957? Regas: The boat was so good that you never had to worry about it. I used to go 180 on the straightaways all the time. I think that's another thing that gave me my winning ways — was the way I felt about the boat. I was so sure of it. So sure of the way it would ride. They had it balanced so good. No matter how many times she came out of the water, she always came down flat — not nose or this way — but flat. I knew she'd come down right. Thunderboat: What was your reaction when Edgar Kaiser reversed his position and decided to bring the Hawaii Kai back for the 1958 Gold Cup? Regas: I was tickled to death. It's hard to explain it — that I was going to get a chance to win the Gold Cup. I knew I had the equipment to win from the year before. I knew how the boat ran. I knew it could beat any of them. I was just thrilled about it. Thunderboat: Did you have any reservations about the Kai's chances not having been run for over 7 months against a fleet that was in mid season? Regas: I knew it would be all right. The boat didn't need much. The boat was in good shape. It was kept in a warm shop all the time. It never got damp. Thunderboat: In qualifying for the 1957 Gold Cup both the Hawaii Kai and Maverick turned a lap of 117.390 m.p.h. Prior to the 1958 Gold Cup the Maverick posted a lap of 120.267 in compiling an average of 119.956-m.p.h. The Kai posted a lap of 119 m.p.h. before going dead in the water. Were you worried about Maverick? How did you plan to deal with the Maverick and Bill Stead during the race? Regas: It made me think. I figured that they had figured out something that would save the engine at that speed. I was worried. I figured if I could get in front of him then he would have to pass me. That was my strategy — get in front of him. That's why I made such good starts. I wanted to get into the turn first. After I got into the turn first I knew he'd never catch me. Thunderboat: In the 1957 Gold Cup you dial 109.823 m.p.h. for 30 miles with your best 15 miles at approximately 111 m.p.h. During heat 1-A of the 1958 Gold Cup you averaged 108.784 m.p.h., but your best 15 miles was approximately 112 m.p.h. You broke in the second heat of the 1957 Gold Cup. Did you have any reservations about being pushed so hard by Maverick in the first heat of the 1958 Gold Cup? Regas: I knew that at the end of that heat I would have a brand new quill shaft for the next heat. I knew I didn't really have to worry about the engine. I tried to take it easy though. Thunderboat: In the second heat again you drew Maverick. But this time Bill Stead beat you to the first turn (south turn). Then in the most dramatic moment of the race you went by him on the backstretch and established a clear advantage by the second turn (north turn). Could you describe this moment from your point of view? Regas: Oh boy, did I (go by him). I said to myself it's now or never. I adjusted my fuel mixture and I held it there. And I punched it. That boat — honest to God — and I was on the outside of him too. I cut him off at the buoy and that was it. Thunderboat: In section C of heat one, Miss Thriftway had matched your best lap of 113.680 and turned a heat of 108 m.p.h. just like the Kai. Unfortunately the Thriftway hit the Coast Guard cutter and was unable to compete against you in the final heat. How did you assess the Miss Thriftway after her first heat performance? Regas: I always worried about Bill (Muncey). I always worried about him because you never knew what he was going to do. If Bill would have been in the final that would have been some race, but I would have won. I had horsepower that Bill didn't even know about. Thunderboat: Then with all the hot dogs out except the Kai, you coasted to win the final heat and the Gold Cup. What were your emotions? Regas: It was great. It felt just great. It really was. Thunderboat: Did you feel like retiring at that time? Regas: Oh no, it was part of me.